In the aftermath of the Arab conquests the Islamic caliphate found itself ruling an enormous territory stretching from modern Portugal to Pakistan, containing diverse populations with different languages, religions, and political heritages. Arabic historical writing was in part an attempt to construct and justify the new status quo of the caliphate and its origins in the conquests. This process involved categorising, defining, and developing ideas about the populations of the newly conquered territories. 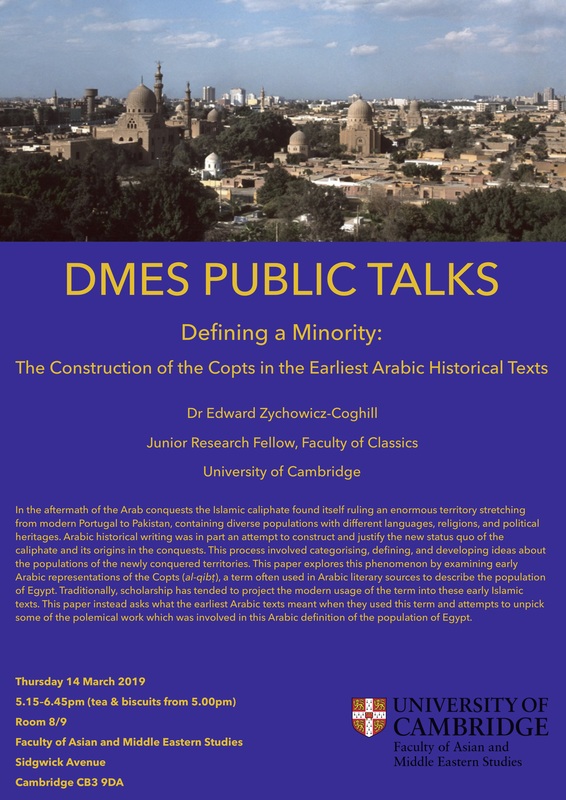 This paper explores this phenomenon by examining early Arabic representations of the Copts (al-qibṭ), a term often used in Arabic literary sources to describe the population of Egypt. Traditionally, scholarship has tended to project the modern usage of the term into these early Islamic texts. This paper instead asks what the earliest Arabic texts meant when they used this term and attempts to unpick some of the polemical work which was involved in this Arabic definition of the population of Egypt. Edward Zychowicz-Coghill has a doctorate from the History department of the University of Oxford, where he also studied as an undergraduate. He also spent time as a PhD student in the USA, at the universities of Chicago and Princeton. He is now a Junior Research Fellow at Christ’s College, and is part of an ERC-funded project based in the classics department at Cambridge, ‘The Impact of the Ancient City’. In this position he researches the representation of ancient origins in pre-modern Arabic writing about cities. His doctoral work was on early Arabic historiography, being concerned with how narratives of the past were constructed, how they were invested with authority, and the functions these stories had within early Islamic society.